Cerebral pyramidal neurons are shown at two magnifications (Golgi stain). 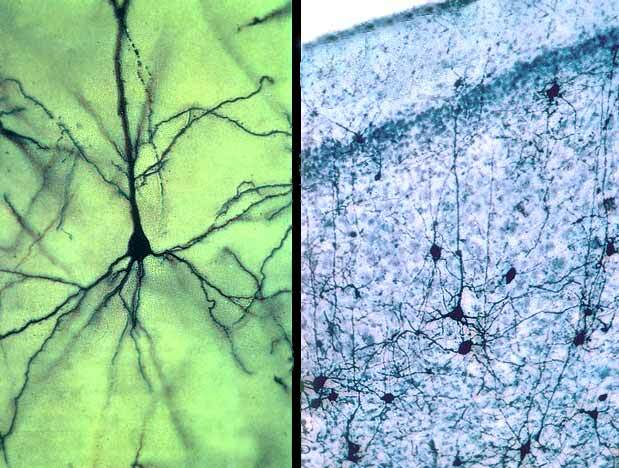 Pyramidal neurons (and granule cells) are typical neurons of the cerebral cortex. Cell bodies of pyramidal neurons have a pyramid shape with a single apical dendrite and multiple basal dendrites. The apical dendrite ascends to the surface. The axon (not evident) runs deep into the white matter.